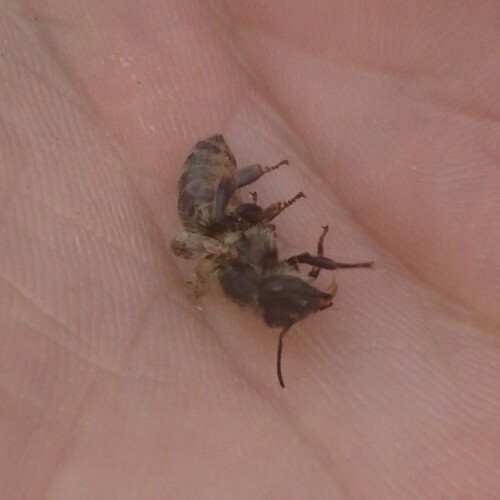 Posted: Fri Jun 30, 2017 7:34 am Post subject: Bees hatching with crumpled wings - is this a sign of varoa? I started keeping bees this year - picked up a swarm in May. You can see details about it on my post here: http://www.biobees.com/forum/viewtopic.php?t=18807. I have now seen the queen, alive and well, and she's laying successfully. Is this a sign of a varoa virus, I read that crumpled wings are a sign? 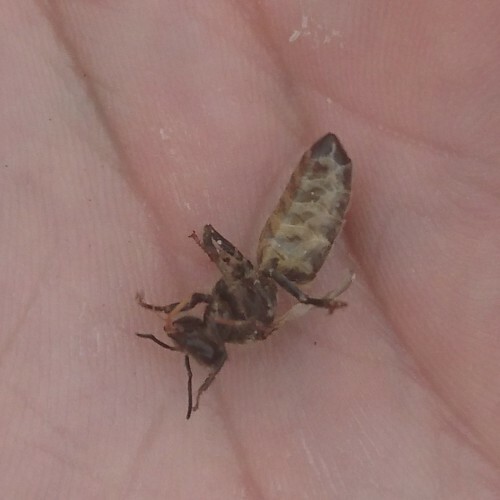 Or do some hatching bees naturally die off for other reasons before they've inflated their wings? Any help much appreciated - as I'm very keen to get my first colony through the winter! Is there anyone close by with more experience who can take a look? 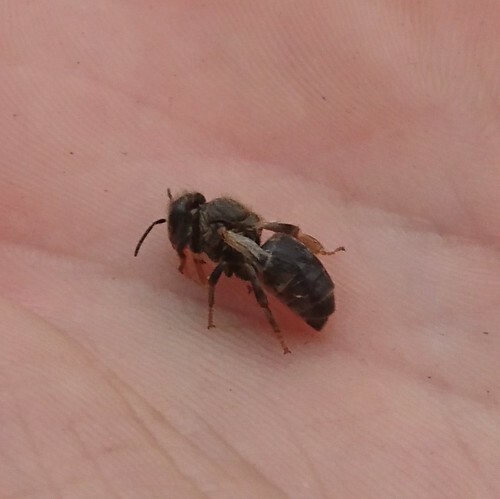 My instinct is that if the vast majority of bees are hatching normally, there is nothing to worry about. If it is a significant proportion with crumpled wings then I would certainly be checking for varroa and probably treating, though I haven't treated my bees for it in about 8 years now. I do remember Barbara taking about some colonies needing time to reach a stage where they can deal with the mites on their own without treatment and this may well be one of those. Yes that is Deformed Wing Virus (DWV) which is associated with a high varroa infestation but not exclusively linked to it. ie the virus can be vectored by other means I believe. I've had colonies that have had low level outbreaks of it and overcome it without treatment but they did not have a high varroa infestation. I would be surprised if this colony is struggling with high levels of varroa yet, if it was started with a swarm last month. 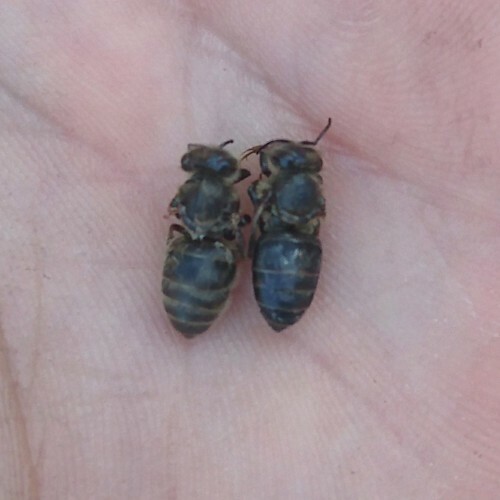 I would familiarise yourself with what varroa look like, and monitor the colony for varroa and DWV. You could perhaps do a sugar roll to check for varroa levels. So .... the big question is.....do you have a booming colony that may be intending to swarm again soon, or a small dwindling colony that may be dying out?....A large strong colony should be able to tolerate a small outbreak DWV and if they do swarm they will benefit from a brood break which will hopefully resolve the problem. If it is a failing colony, this may become the finish of them. Hopefully your situation is the former?? Sadly not - the local beekeeper who has been helping me is away. I will ask her to look as soon as she's back. I would be surprised if this colony is struggling with high levels of varroa yet, if it was started with a swarm last month. I would familiarise yourself with what varroa look like, and monitor the colony for varroa and DWV. When I removed the mesh that I had above the baseboard, I tipped the contents of the baseboard out and sifted through it. It was predominantly lots of small ~3mm white wax flakes. Mixed into this were however a few dead varoa mites, which I was able to inspect to see what they look like properly. I found three in amongst this debris, and the colony has been in there since 30th May. I also found one wax moth larvae - though no evidence of wax moth on any of the comb. I am hoping the bees have this under control, but will monitor as well. You could perhaps do a sugar roll to check for varroa levels. This is a good idea - I will do this to check for live varoa on the bees. 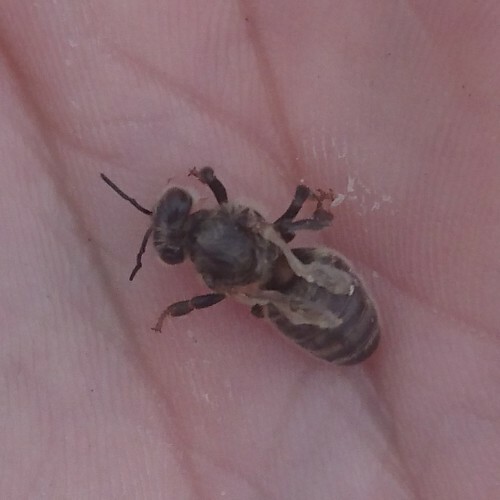 At this point in the season, what would be an acceptable level of varoa per # bees? Positively, I haven't found any more bees with DWV, though I don't know how many the colony may be self-cleaning from the hive. One thing that concerns me a little is that this colony appears to be producing drones, since your first photo looks to be a drone with DWV. Normally a swarm would not waste it's resources on producing drones in it's first year unless it was very strong and considering swarming again. It may be, but when I checked at the weekend, I didn't find any drone cells in among/below the brood comb (and haven't on any of the checks since the colony established). I may have missed it though. That bee did look like a worker in my hand, I still have it and will photograph again this evening. The colony is growing fast (doubled in size now), there are about 6 bars with brood now, many cells have already hatched and have new larvae developing in them. I have seen the queen, and she appears to be healthy - all cells on brood comb have a single developing larvae in. A large strong colony should be able to tolerate a small outbreak DWV and if they do swarm they will benefit from a brood break which will hopefully resolve the problem. should I just look out for queen cells to indicate they may be preparing to swarm? Sounds like it's just a combination of camera angle and my diminishing eyesight then. Pleased you didn't see any drone brood and that you are no longer seeing bees with deformed wings. The sugar roll test is to determine how many mites there are per 100 bees. When you do the test, you will need to double the number you calculate.... because you have brood in your hive. If the final number is over 10 mites per hundred bees, you need to consider treatment. 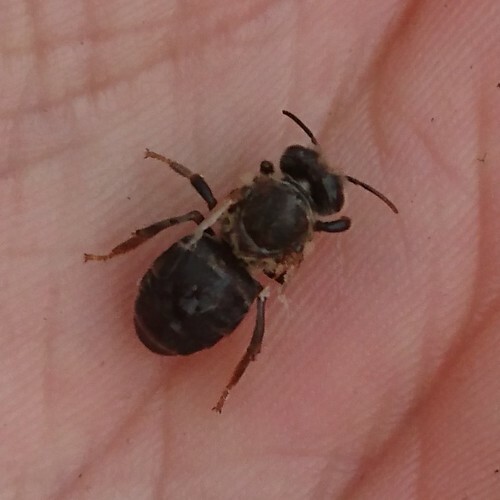 So, if your sample is about 50 bees and you get 3 mites from the test, that would be 6 mites per 100bees but because you have brood, you need to double that to 12 and they would therefore probably be in need of urgent treatment. Because you are working on the number of mites per 100 bees, rather than a mite drop over the whole population, which obviously fluctuates throughout the year, you don't particularly need to factor in the time of year with this particular test. It sounds to me that they are otherwise doing well and this may just be a minor outbreak of DWV but definitely keep an eye on them for further problems even if your sugar roll test comes back low. Good luck with them and please report back with results if you do carry out the test. Here's another shot of the same two side by side, though still not a great shot I'm afraid! Though I haven't seen any more deformed wings - would the bees be clearing any from inside hive floor? Positively, I haven't seen any live bees on the combs with deformed wings. The sugar roll test is to determine how many mites there are per 100 bees. (...) Good luck with them and please report back with results if you do carry out the test. Thank you - I will do the sugar roll test as soon as possible and let you know the results! Out of interest, will early (May) swarms ever grow enough in their first year to naturally re-swarm (rather than re-swarming due to e.g. parasites/moths) or warrant a split towards the end of the summer? I'd always assumed swarms and splits were when colonies were well-established post a successful overwinter, and grew quickly in the spring. Yes a strong early swarm can build up quickly and swarm again within 8-10 weeks, if conditions are good, especially if they were given some old brood comb to get them started. I put a swarm into a Warre for someone a couple of years ago and they swarmed again 8 weeks later and threw a cast swarm after that as well. I have not experienced them swarming due to moths or other parasites. Those are usually indications of a failing colony and I think people assume they swarmed when in fact they just petered out, perhaps as a result of being left queenless by earlier swarming. Usually it is people who have hives at out apiarieas and don't see their hives on a regular basis (ie daily) that speculate about such things. Now I have glasses on and a clearer picture, those are both looking like workers. Great - thanks Barbara - I'll keep a close eye on them over the coming weeks then as the colony is growing noticeably by the week!